Program for receiving information about Windows errors, enter the error code and get the error description. Portable open source tool which can help by translating error codes into a more meaningful text description. The interface is simple - just a box to type your code, and another which displays the details - so there doesn’t seem much to learn. 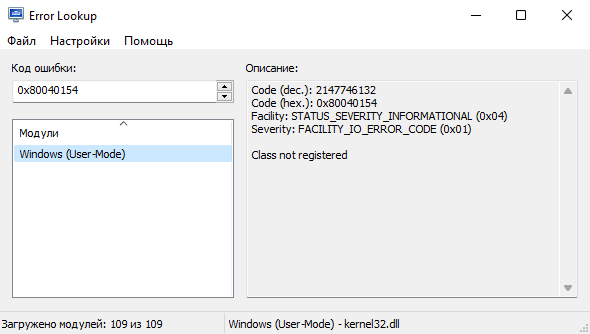 The program also supports a wide range of codes: regular Windows errors, DirectX, NTSTATUS errors, Windows Internet errors, STOP codes, And we think it can probably be configured to read more (Settings > System modules), although there’s no documentation to confirm that and we didn’t test it. The lightweight application is less than a megabyte, and it is compatible with Windows XP SP3 and higher operating systems. You can download either the installer or portable version. To activate portable mode, create errorlookup.ini in application folder, or move it from %APPDATA%\Henry++\Error Lookup. Binaries have GPG signature errorlookup.sig in application folder. Put errorlookup.lng file into application directory and restart the program.